This elegant worked gold filigree cufflink bracelet by designer Shlomit Ofir is sure to add a touch of sparkle to any outfit. Designer Shlomit Ofir creates pieces that combine classic motifs with modern style. 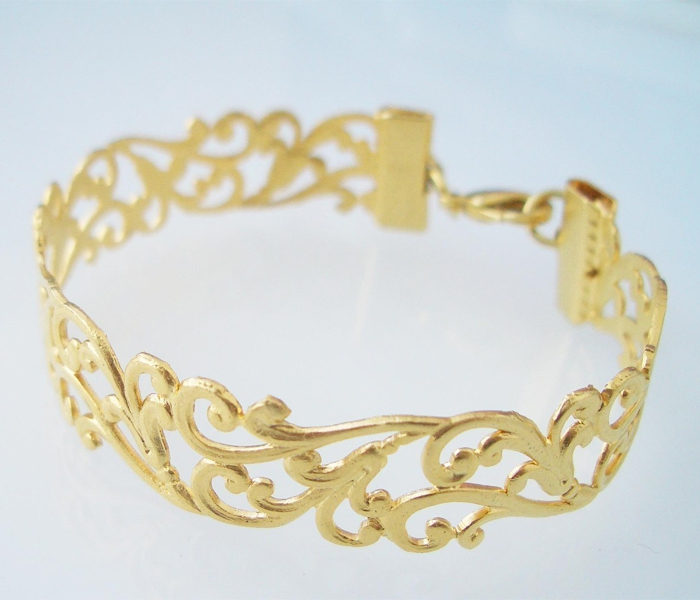 This gold filigree cuff is an example of her work. The Arab-style filigree design in 24 karat matte gold-plated brass encircles the wearer's wrist and can be worn as a formal piece or with a more casual outfit. 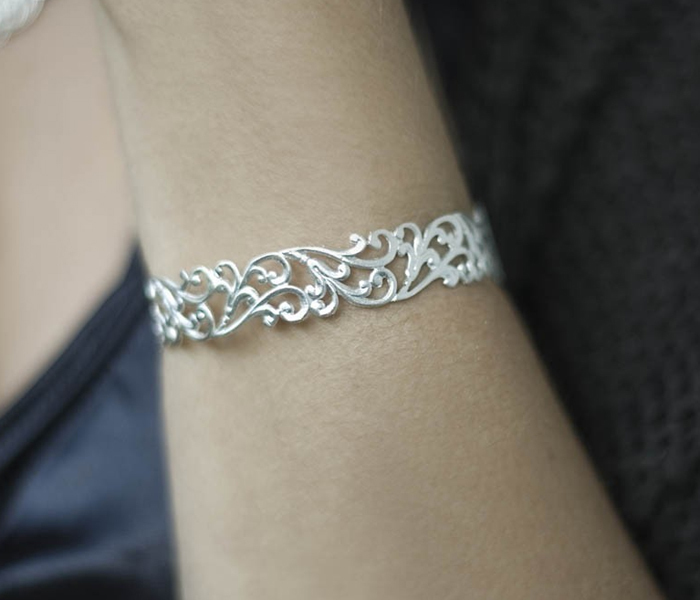 The light, open filigree work, which suggests but doesn't copy the form of climbing vines (Ofir is greatly inspired by nature and many of her designs depict flora and fauna) keeps the traditional cuff style from appearing too solid. The piece captures the same subtle touch found throughout Ofir's collections of delicate handmade jewelry. The gold bracelet will appeal not only to collectors of Israeli jewelry, but to most people who like to wear a touch of wrought gold. Like any piece of fine jewelry, the Lia gold cuff bracelet can go from day to night easily. 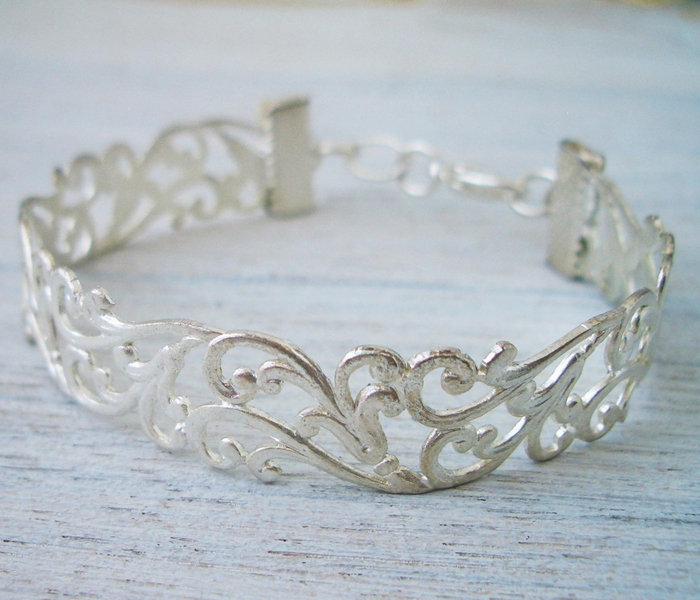 The bracelet measures 6 inch (15 cm) and comes with an adjustable chain to allow it to fit most sizes.The Lia filigree cuff is a perfect gift and a wonderful example of how Israeli jewelry can reflect international taste while keeping a Mediterranean flavor.